~Above photo courtesy of Mark Moore. ~ Story from The CCHS Archives, unknown author. ~ The "Lady of Justice" came down from her pedestal on July 23, 1981. This was quite an attraction to the area residents. KDKA-TV crews from Pittsburgh were on the scene filming the descent of the lady. At approximately 3:30pm she was raised from her position by pulley. Scaffolding was erected around her previous to her removal. Three workmen carefully guided her down to the main roof then lowered her. Prior to this the crew did not know how much she actually weighed and removal of the statue was a main concern on their part. Upon examination she was quite deteriorated. Her left arm, the arm that held the "scales of justice" was missing. Rumor has it that a small airplane hit her arm and scales a few years ago causing the statue considerable damage. There were approximately 25 bullet holes in the statue and she was quite weathered. As stated previously she was made of galvanized iron. However, the material that she is comprised of is zinc. When measured she stands 9 feet, 11 inches in height and her approximate weight was estimated to be 125 pounds. The female figure of "Justice" comes to us from Greek mythology. Themes, Mother of the Fates and the Seasons, were the goddess of divine justice. The rites of hospitality were under her protection and she also presided over public assemblies. She is represented in art as a commanding, austere woman holding a sword and scales, the symbol of order and justice. Her daughter, Astraea, who wears a crown of stars also, represents justice in classical mythology. It has not been determined who designed this statue, which is hollow. 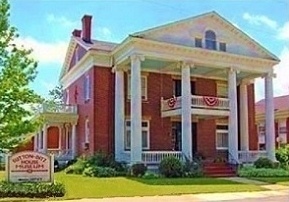 By what method it was originally placed atop the Clarion County Courthouse is also not known. 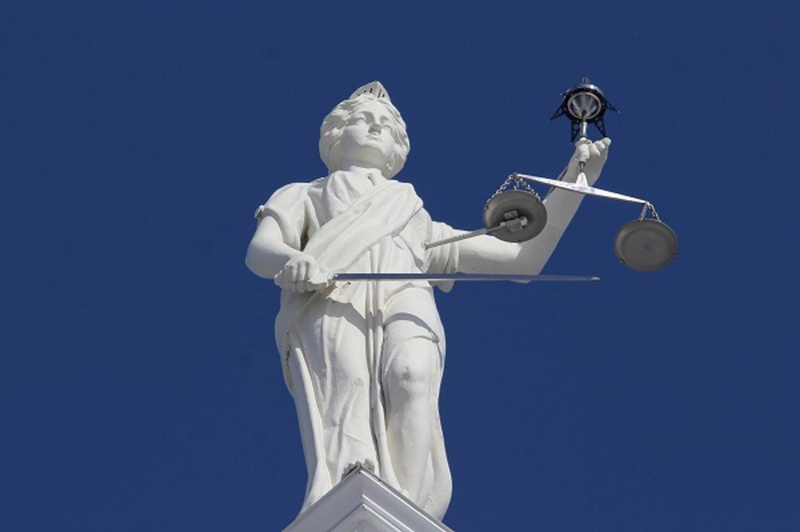 It is likely the identical figure produced from the same mold was used at other courthouses, as Themis is a fitting guardian for a hall or justice and a government seat. The "Lady’ was then placed in a small van and taken to the firm of Ranochak & Company located in Shelbyville, Indiana. There she was restored with a fiberglass coating shaded in the pewter color. She now weighs approximately 250 pounds upon restoration. Plans were made to have the "Lady of Justice" on display in the courthouse. A ceremony was planned for her return trip to her pedestal for 3:00pm august 24, 1981 at which time a time capsule was inserted in the base of the statue.